What is Dentrix Smart Image? What can Smart Image do for you? Every time you acquire diagnostic images without Smart Image, there’s potential for oversights that cost time and revenue. Smart Image starts each image acquisition with selecting the correct CDT codes. This helps improve accuracy—and decrease time—by labeling images for later recall. For select vendors, imaging procedures are also posted to the ledger, progress notes, and recare—saving time while increasing accurate tracking. Standalone imaging solutions slow you down when you switch in and out of the practice management system during treatment. 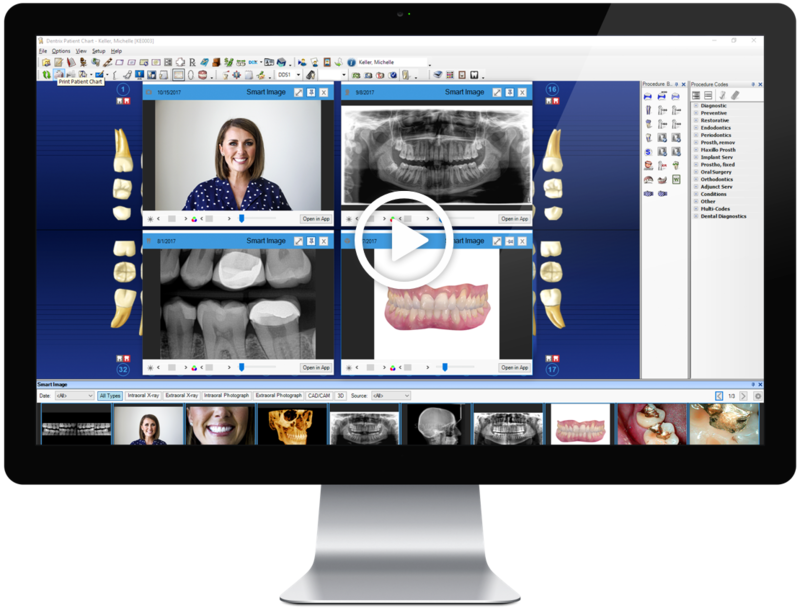 Smart Image enhances your clinical efficiencies because it connects image acquisition to the patient chart, giving you access to digital image thumbnails from many different 2D and 3D devices — without leaving Dentrix. Avoid payment delays due to inaccurate CDT codes. Dentrix Smart Image associates your digital images with the correct CDT codes and then automatically posts the imaging procedure to the ledger for select vendors. This helps improve billing accuracy and streamlines the insurance management process. Dentrix Smart Image is made with the dental office and their technology in mind. It is also open to all imaging vendors who are willing to participate in the Dentrix Smart Image developer program. Check out the below vendors to see who’s in the program or suggest a vendor who isn’t. Dentrix Smart Image is included in Dentrix G7 and requires a current customer support plan. To start using Smart Image, upgrade to or purchase Dentrix G7. As connectors for the Smart Image vendors become available you can request them by completing the form below or by contacting the vendor as noted in the vendor listings. Patient images are accessed using vendor-provided thumbnail images on the Patient Chart (in a thumbnail tray). Images loaded to the thumbnail tray can be for a single tooth, a quadrant, or all available images for the patient*. 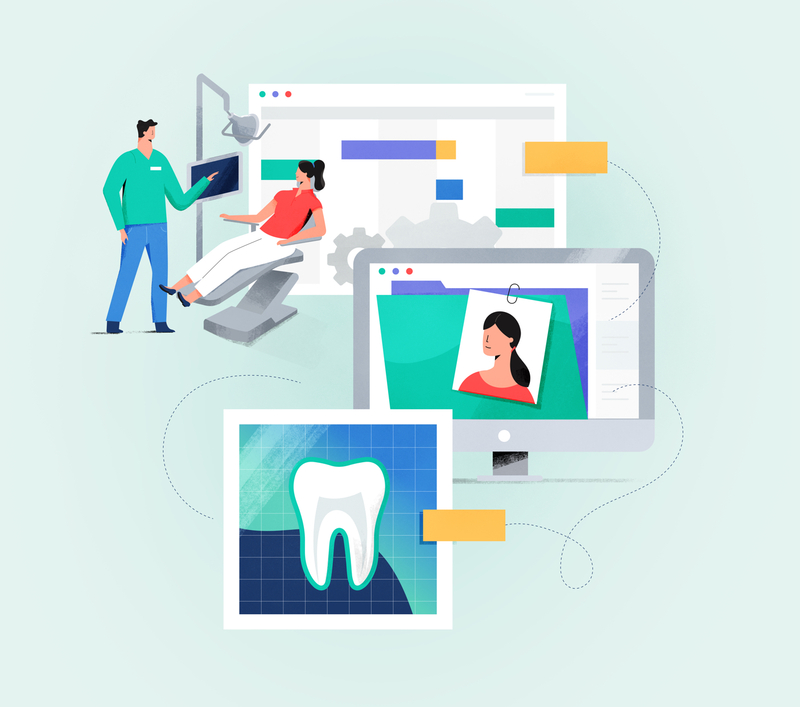 Images in the thumbnail tray can be filtered by date, vendor, or type (Intraoral X-ray, Extraoral X-ray, Intraoral Photograph, Extraoral Photograph, CAD/CAM, 3D). Enlarged vendor images appear on the Patient Chart when selected from the thumbnail tray. Single images can opened in the Dentrix diagnostic viewer (single click). Single images can opened in the vendor’s image viewer (double click). Up to four enlarged images can be “pinned” to the screen at once for diagnosis, treatment presentation, etc. A panel of all six image types shows the most recent image for each type. Users can click through previous images for each type. Image acquisition can begin on the Patient Chart with selection of the procedure and confirmation of the CDT code. Smart Image automatically opens the imaging vendor’s software and arms the sensor for the selected procedure. Upon completion of the imaging procedure, Smart Image automatically posts the procedure to the Dentrix Ledger (for billing). Smart Image automatically updates the patient’s continuing care record with the date of the images. We strive to develop and manufacture high-tech medical devices that enable dentists and surgeons to implement minimally invasive, safer and quicker operating protocols that are less traumatic for their patients. Dentsply and Sirona joined forces in 2016, to become the world’s largest manufacturer of professional dental solutions. Our trusted brands have empowered dental professionals, in both practices and laboratories, to provide better, safer, and faster care in all dental disciplines for over 100 years. DEXIS is an industry leader in developing high quality digital imaging solutions for the dental community. We build strong partnerships with our doctors and their teams, based on long-term, interactive relationships. Planmeca is one of the world's leading manufacturers of digital dental units, CAD/CAM solutions, 2D and 3D imaging devices and software solutions. Innovative R&D and successful industrial design have been the leading values for Planmeca Group for decades. HDW WILL, HQ located in South Korea, specialized in manufacturing dental imaging systems, recently opens its office in Los Angeles, California. Whether you are new to CBCT or are looking to trade up, Dentri is a clean, efficient 2 in 1 system that delivers outstanding clinical capabilities. PreXion has over 15 years of experience with DICOM image processing and software visualization. PreXion has improved the reliability and quality of all CBCT core technologies including the X-Ray Tube and the Flat Panel Detector (FPD) for both CT and Cephalometric. For nearly 30 years, SOTA Imaging has engineered some of the most recognized imaging products in the scientific and medical communities, including producing optical components for NASA and Abbot Laboratories. This experience has allowed us to create dental products that continue to break barriers with the most advanced digital imaging technologies. Today, SOTA engineers are setting even greater goals: to create dental technologies that make dental work easier and more enjoyable - all while maintaining the highest standards we set out from the very beginning. Welcome to the exciting future of state of the art technologies. Superior Imaging, Intuitive Design, Advanced Features. XDR’s Dental Imaging Software is clinically engineered for ease and diagnostic power. Designed by dentists for dentists.